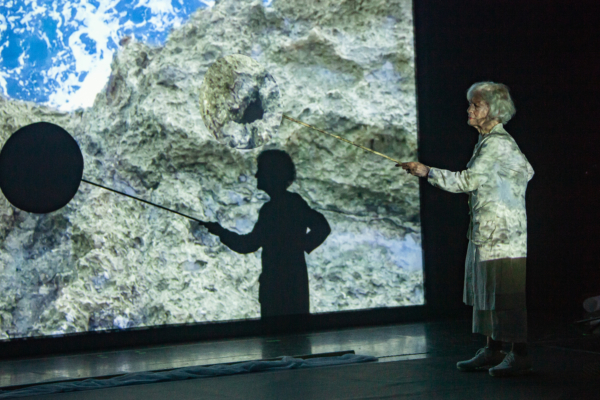 Joan Jonas’s exhibition “Moving Off the Land II” is the inaugural public project at the Ocean Space. The installation is the culmination of three years of intensive research in aquariums around the world as well as in the waters off the coast of Jamaica, commissioned by TBA21–Academy. Curated by Stefanie Hessler, and on view from March 24 until September 29, 2019, “Moving Off the Land II” unfolds across 500 square meters of what was once the nave of the church of San Lorenzo. The show comprises new video, sculpture, drawing, and sound works, as well as a performance on May 7, 2019, centering on the role the oceans have played for cultures throughout history as a totemic, spiritual, and ecological touchstone. Joan Jonas is one of the most renowned artists of her generation. She is celebrated as a pioneer of performance and video art since the 1960s, a time when art was leaving the confines of the gallery space, converged with dance, music, and theater and tackled complex questions surrounding our relationship with the environment. For her latest work, Jonas has devised a large-scale installation that deconstructs and translates her mesmerizing performance Moving Off the Land (2016–ongoing). The exhibition includes video, sculpture, drawing, and sound, centring on the oceans as a totemic, spiritual, and ecological touchstone. The performance was commissioned by TBA21–Academy and first presented in parallel to the 2016 Kochi – Muziris Biennale, and again in collaboration with Tate Modern at the Turbine Hall in 2018. As is often the case in Jonas’s work, the performance has grown and morphed since its first iteration. During the opening days of the 58th Venice Biennale in May 2019, it will be presented in an expanded version in the exhibition at the Ocean Space. Jonas represented the United States at the 56th Venice Biennale. With her new work, she returns to Venice and revisits some of the themes touched upon in her US Pavillion exhibition They Come to Us Without a Word: the natural environment and the animals inhabiting it—from bees to fish—as well as the present danger of climate change and extinction. This new exhibition pays tribute in particular to the oceans and their creatures, biodiversity, and delicate ecology. Jonas’s new work dives deep into the oceans, swims with the fish that inhabit the world’s hydrosphere, and turns to literature and poetry by writers who have homed in on the liquid masses that cover two thirds of the planet. 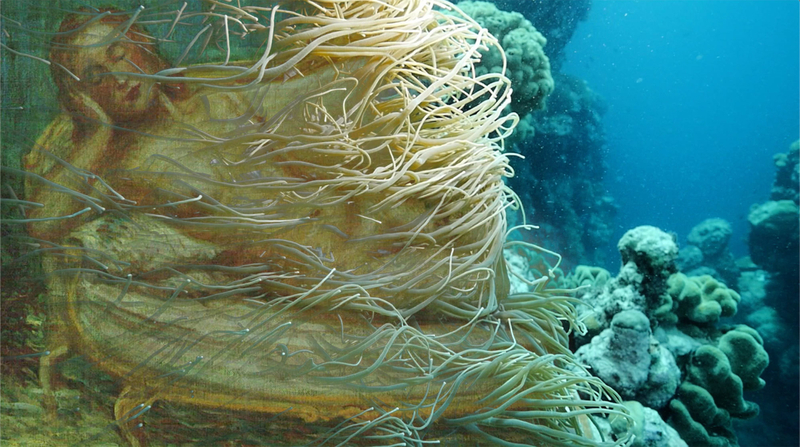 Following the methodology that has gained her lauded reputation, Jonas combines prose by writers like Emily Dickinson and Herman Melville with texts by Rachel Carson and Sy Montgomery, and with moving images filmed in aquariums around the world as well as at the coast of Jamaica, where algae blooms and overfishing pose urgent threats to the environment. Employing her own voice, as well as music by the celebrated composer and drummer Ikue Mori and by the acclaimed musicians María Huld Markan Sigfusdottir and Ánde Somby, Jonas creates an evocative, poetic, and spellbinding experience. Over many years, Jonas has visited and recorded footage in aquariums around the world. In the last year and a half, as part of a sustained dialogue about their respective work, the marine biologist and coral reef and photosynthesis expert David Gruber has shared with Jonas his captivating underwater recordings that focus on bioluminescence. In 2018, Gruber visited Jonas at her summer home in Cape Breton, Canada, where he shot footage of Jonas’s dog, Ozu, playing on the surf on the shoreline. The exhibition at Ocean Space is the first in a series of shows, performances, symposia, concerts, screenings, and other events organized by TBA21–Academy that explore the oceans from different perspectives over the course of the coming years. 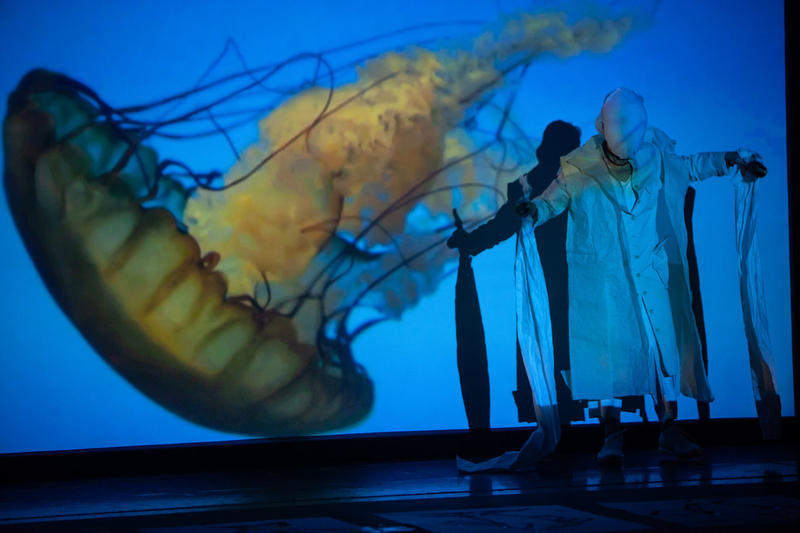 As a digital extension of Joan Jonas’s exhibition, Ocean Archive, a project initiated by TBA21–Academy and currently under construction, will publish a selection of complementary material, including an exclusive interview with Jonas and Hessler, videos of previous and related works, and additional materials that have influenced and informed the exhibition in Venice. Ocean Archive is a digital colaboratory operating at the intersection of scientific inquiry, artistic intelligence, and environmental advocacy. Created by TBA21–Academy, the platform hosts materials related to Academy expeditions, exhibitions, and public events and integrates these into a curated selection of additional ocean-related art, scholarship, and information about policy and conservation efforts. Designed to facilitate discovery, cooperation, and knowledge co-production, Ocean Archive is currently being developed by User Group Inc. for TBA21–Academy and will be launched at the Ocean Space in Venice, Italy, on September 21, 2019. For March 2019, Office for Political Innovation by Andrés Jaque collaborated with Joan Jonas to create an initial interior platform that forms the setting for Moving Off the Land II a performance space in part of the church. Tuesday, May, 7, 21.00. Performance by Joan Jonas at Ocean Space.